The 918 Spyder is a mid-engined two-seater sports car; powered by a 4.6 litre V8 engine. The engine is built on the same architecture as the one used in the RS Spyder Le Mans Prototype racing car without any engine belts. The engine weighs 135 kg according to Porsche and delivers 608 hp at 8,500 rpm & 528 N·m of maximum torque. In Car and Driver's independent test of the Porsche 918 achieved 0-60 mph in 2.2 seconds, 0-100 mph (160 km/h) in 4.9 seconds, 0-180 mph (290 km/h) in 17.5 seconds, and the 1/4 mile in 9.8 seconds. In Motor Trend's independent test of the Porsche 918, they also claimed it was the fastest car to 60 mph that they had ever tested. It stopped from 60-0 mph in 94 feet (97-0 km/h in 29 m), and broke Motor Trend's figure 8 record at 22.2 seconds. Sports car manufacturer Ariel announced in February 2008 the Ariel Atom 500. It features a 500 horsepower 3.0 litre John Hartley designed V8 engine, carbon fibre body panels and aerofoils, chromoly aerofoil wishbones, integrated function steering wheel, Alcon four-piston brake calipers, and Dymag magnesium wheels. The engine weighs 90 kg and is coupled to a SADEV 6-speed sequential gearbox to cope with the increased power over the Honda unit. During the development process the RS performance engine was replaced by a unit prepared by Hartley Enterprises giving the final production version of the 550 kg (1,213 lb) car 909 bhp/tonne. Ariel claims this variant will accelerate from 0-60 mph in "less than 2.3 seconds". The Bugatti Veyron EB 16.4 is a mid engined sports car, it has a top speed of 407 km/h (253 mph). It has 0–100 km/h (0.0–62.1 mph) in 2.46 seconds. The 8.0-liter, quad-turbo W-16 engine positioned behind the passenger cabin sends a hearty 987 hp forward to a Ricardo seven-speed, dual-clutch manu-matic transmission. The performance figures that are claimed for this 4,300-pound two seater are simply out of this world: 0 to 62 mph in 2.46 seconds, 0 to 125 mph in 7.3 seconds, and 0 to 188 mph in 16.7 seconds. The Lamborghini Sesto Elemento is a two door, two seater, 5.2 litre V10 engine; with a 6-speed semi-automatic transmission with paddle shift and all wheel drive system high-performance lightweight limited edition car. It's engine generates 570 hp and 540 N·m of torque. The chassis, body, drive shaft and suspension components are made of carbon fiber, reducing the overall weight to a mere 999 kilograms (2,202 lb), a weight comparable to subcompact car. Lamborghini claims a 0–100 km/h (0–62 mph) acceleration time of just 2.5 seconds and the Top speed 210 mph. 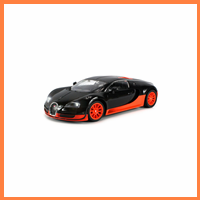 The Bugatti Veyron 16.4 Super Sportis a faster, more powerful version of the Bugatti Veyron 16.4. Production is limited to 30 units. The Super Sport has increased engine power of 1,200 PS (1,200 bhp), a torque of 1,500 N·m. The Super Sport has a 431.072 km/h (267.856 mph) top speed, making it the fastest production road car on the market although it is electronically limited to 258 mph .The Super Sport's standard acceleration 2.5-second 0-62-mph. The Caparo T1 is a British mid-engine, rear-wheel drive, two-seat automobile built by Caparo Vehicle Technologies. The T1 has a dry weight of 470 kilograms (1,040 lb). The engine including a smaller 2.4-litre supercharged unit. The production design generates a maximum power of 575 hp at 10,500 rpm and a maximum torque of 310 pound-feet (420 N·m) at 9,000 rpm, The engine is controlled via a fully tunable Pectel SQ6 engine control unit and the throttle is controlled via a throttle-by-wire system. The T1 has an estimated maximum speed of 205 mph on a low downforce setup. it has an estimated 0–100 kilometres per hour (0–62 mph) time under 2.5 seconds and onto 160 kilometres per hour (99 mph) in 4.9 seconds. The Koenigsegg One:1 was presented at the Geneva Motor Show as World's first Megacar. Equipped with Koenigsegg aluminum 5,0L V8, 4 valves per cylinder, double overhead camshafts with flex-fuel capability. It delivers over 1000 Nm from 3000 to 8000 rpm of torque (maximum torque being 1371 Nm at 6000 rpm). The vehicle’s capable of developing acceleration of 0-400 km/h (0-250 mph) in jaw-dropping 20 s, 0-60 mph(0-100 km/h) in 2.5 sec. It reduces the speed of 400-0 km/h in only 10s, and its braking distance is 28 m (100-0 km/h). Seven examples, including one prototype, were built during 2014 and 2015. The Bugatti Veyron 16.4 Grand Sport Vitesse is a version of the Grand Sport with a Super Sport engine. It produces a maximum output of 1,200 PS (1,200 bhp) @ 6,400 rpm and a maximum torque of 1,500 N·m (1,100 lb·ft) @ 3,000-5,000 rpm. These figures allow the car to reach 100 km/h (62 mph) from standing in 2.6 seconds. On normal roads, the Vitesse is electronically limited to 375 km/h (233 mph). The Hennessey Venom GT is a sports car based on a heavily modified Lotus Exige chassis, manufactured by Texas-based Hennessey Performance Engineering. Engine Type: 90-degree V8 overhead valve, 2 valves/cyl iron /aluminum twin precision ball bearing turbochargers 1244 bhp @ 6600 rpm (cockpit-adjustable to 800, 1000 & 1244 bhp) 1155 lb-ft @ 4400 rpm 7000 cc/427 cu. in. 9.2:1 7200 rpm. It's standard acceleration 0-60 is 2.7 seconds and 0-100 is 5.6 sec.